This high energy breed is becoming more popular each year, both as pets and as famous TV personalities. “Eddie” on Frasier is a wire-haired Jack Russell who has brought a lot of attention to the breed. These feisty terriers were originally hunting dogs from England. The muscular, agile body and strong drive made them valued for fox hunting. Their tails were docked to a length to be used as a handle to pull them out of fox holes. This breed is not officially recognized by the Canadian Kennel Club and therefore it is impossible to buy a “registered” puppy. 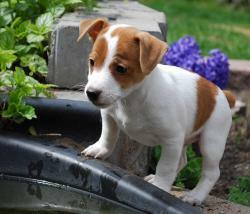 There are two Jack Russell associations in Canada that have strict guidelines for membership. These include coat colour, body confirmation and health. The Jack Russell can make a great pet in the right situation. They need considerable exercise and direction, as well as plenty of socialization with people and other dogs at a young age.